Motivating people to lose weight is a tricky challenge for primary care physicians. Everyone seems to need something a little different. What motivates me, as a primary care physician, might not be what motivates you. The Wall Street Journal published an interesting article, http://on.wsj.com/17vARAb, looking at new ways physicians motivate patients. Scolding is out and following the patient’s lead is in! For example, when it comes to managing your weight, I might think you need to do 20 – 30 minutes of cardiovascular exercise each day, but if you think you can only accomplish that on the weekends, I should be supportive of your goal. Or perhaps you are intimidated to start an exercise program, but are willing to eat vegetarian one night each week to reduce your meat intake and increase your vegetable intake. I should embrace that idea and encourage you to begin an exercise program during another visit, when you are ready for it. As physicians, we’re trained to be problem solvers. Bring me your problem and I will tell you the solution. The thing is that there are often many “right” solutions. We doctors need to make our patients part of the decision making team. In fact the patient is the key stakeholder in any decision, and as such, he or she should have the final say each step of the way. Sometimes patients set goals that are modest and unlikely to result in significant weight loss results for months. That’s OK! As long as the patient has realistic expectations, slow and steady is a great way to go. In fact, the small and consistent improvement from modest attainable goals can spur motivation and improve outcomes, as compared to an unsustainable and therefore frustrating goal. Aim too high and a person might just give up the entire effort. The key is to keep setting goals and evaluating them. If you set a goal to walk home from the train every day, eventually you should consider a goal to jog home from the train. Or perhaps you eventually tweak that goal to include walking on the weekends, as well as walking during the work week. So, what is your goal for this week? What is your goal for the upcoming month? Start modest and track your progress, posting a reminder on your bathroom mirror and perhaps on your fridge as well. 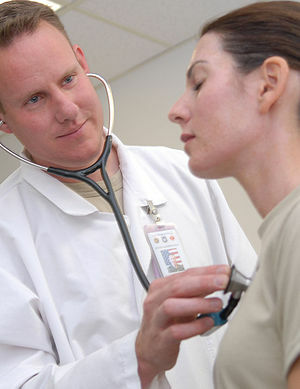 If you need to lose weight, talk to your primary doctor about goals that are appealing and realistic for you. I hope your doctor read the terrific Wall Street Journal article and knows that scolding doesn’t motivate people to change. Take the first step toward improving your health and write down your goal right now! Thanks for listening. I wish you the best of health.